WITH a heavy marketing focus on its hot hatch origins harking back nearly 30 years, the Peugeot 208 will hit showrooms priced from $29,990. Peugeot says this is the "real deal" when it comes to the GTi badge. Forget the 206 and 207 GTis which have come before it, the French carmaker says this is a modern reincarnation of the famed 205 GTi which garnered admiration for its grip, fun and performance three decades ago. Under the bonnet is a much-lauded and seven-time winner of the international engine of the year award, a potent turbocharged 1.6-litre four-cylinder. The 147 kilowatts and 275 Newton meters may not sound like big figures, but it is only pushing just over one tonne of weight. The 208 GTi sits on a 10mm widened track at the front and 20mm widened track at the rear. And Peugeot is talking up the internal qualities. They say its up there with the best from Audi, BMW and Mercedes-Benz in terms of fit and finish. Standard equipment includes leather trim with red stitching throughout the cabin, awesome small sports steering wheel, 17-cm colour touch-screen, Bluetooth audio and phone connectivity, sat nav, dual zone air con, digital speedo and trip computer, along with a six-speaker sound system with two USB ports. Externally, it's a powerful looking little thing. It features a gloss black rear skirt, an exhaust with a trapezoid chromed double tailpipe and pumped up wheel arches filled by 17-inch alloys. The 208 GTi is the first of five new models in the next 10 months for Peugeot. The compact SUV 2008 is due in October, followed by the updated 5008 and 3008 SUVs early next year. Then Peuegot's most powerful car, the RCZ R will arrive in April 2014. "We are very excited to be launching the all-new 208 GTi to the Australian market. This car is a halo car for the 208 model line-up as well as the Peugeot brand,'' said Peugeot Automobiles Australia general manager/director Bill Gillespie. 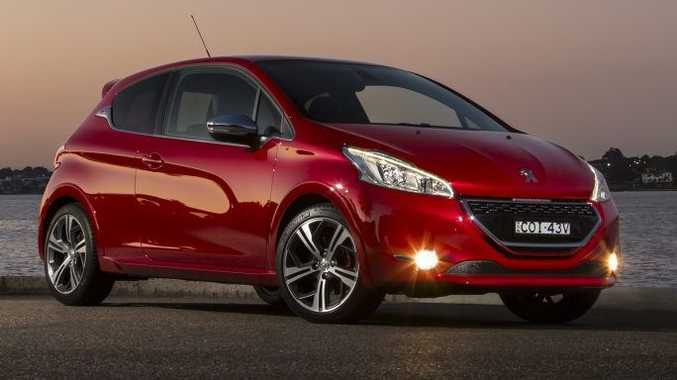 "The new 208 GTi draws a direct link back to the original hot hatch predecessor, the 205 GTi. 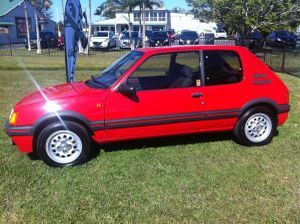 The 205 GTi built the Peugeot hot hatch reputation and the 208 GTi is a modern take on that hot hatch theme. "In addition to the RCZ, the new 208 GTi will represent two strong halo models for the Peugeot brand in Australia. Whilst appealing to Peugeot traditionalists we believe the new 208 GTi will bring new buyers to the Peugeot brand. Details: Three-door front-wheel drive compact sports hatchback. Engine 1.6-litre four-cylinder turbo petrol generating maximum power of 147kW and peak torque of 275Nm. Performance: 0-100kmh in 6.8 seconds.